Due to some work commitments I have not been able to fix my travel dates until yesterday when I finally purchased tickets to visit Finland! Next Monday I fly the Finnish national carrier Finnair to Tampere (in the southern center part of Finland) via Helsinki, from where I will drive to the summer house with my parents. The summer house, the Finnish equivalent of paradise, here I come (am permitted to say paradise, because temperatures are supposed to climb close to 30C next week!). I am very much looking forward to spending time at my family’s summer house by a lake, because this is where some of my best memories come from. Pike spotting in the willows, watching dragonflies land on the lake, breathing the century-old forest after the rain, heating the sauna, swimming in the lake, water skiing, picnic on one of the lake’s many islands, etc. Our beautiful lake has turned into a monster! A must-try at the Finnish summer house! PS It is difficult these days to figure out airlines’ logic! To my surprise, it was cheaper for me to purchase Paris-Helsinki-Tampere and Helsinki-Paris, than to buy a Paris-Helsinki-Paris. Curious. Until now I have mainly used SAS when I need to fly to cities other than Helsinki in Finland, but it seems Finnair does have some pretty good deals, too. 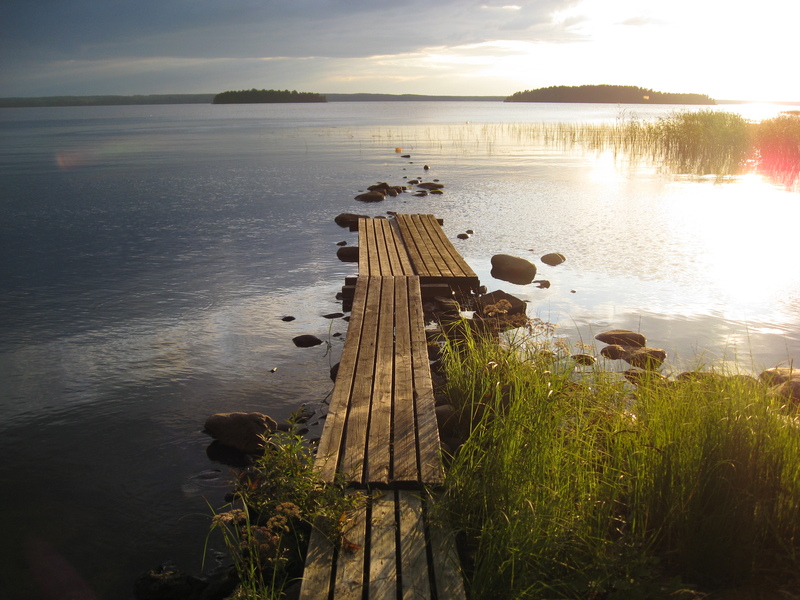 This entry was posted in Uncategorized and tagged airline, Finland, summer house on July 3, 2014 by Miia. Thanks! Hoping the weather really turns as nice as predicted! It looks beautiful, wishing you a lovely holiday! I’ll keep mine crossed for you too! Thanks 🙂 And the weather is supposed to be almost 30C, so crossing my fingers!! Thanks Rashmi! Hope you are well, and yes, let me know if and when you plan to visit Finland 🙂 Take care. I’ve been enjoying your wonderful photos of Finland. Nice to have found you via The Travellers Tree! You are right, Paris is great too! Soon it will be August, which is a nice month because many locals are away and the city is empty and quiet (less cars, pollution). We like staying there in Aug, and prefer going away again in September. “Summer” is over already for us. We haven’t made any Christmas plans yet but we’re working on it! How often do you go back home? Really??? that hot?? Ohh wow I didnt know it was that much this year! Here in Germany is cooler than last year so far. That’s is nice to go in Jan and again in Oct! Yeah it is very exceptional in Finland to be that hot and for such a long time. It has been one month now. hahahahaha you are so funny! Makes me laugh 😀 thank you for that!